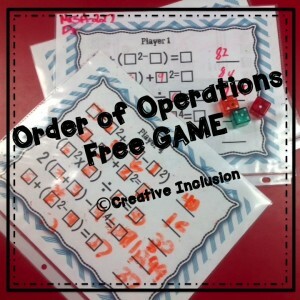 Home » Uncategorized » Order of Operations Freebie! Students not loving Order of Operations worksheets? Try this FREEBIE instead!!! I created this game to help with motivation with this task. There are playing cards for 6 players. Each player gets 3 die. I use dice within dice with more advanced students and just add the inner dice to the outer dice for a bigger number to work with. Students are to experiment with putting the numbers in a different order to see which order produces the largest final answer. They will see that it matters very much which operation to complete first, as it can drastically change your answer. Add up the answers and the player with the largest final answer is the winner of the game. This can be modified for different levels of students very easily. They can work in partners and either do the problems together, or they can check each other’s work.